We had such a treat last night: a cooking demonstration and traditional Saudi Arabian meal, right here at the schoolhouse. Nora (an approximation, I think!) and her daughter Sarah did the cooking, while Aziz, the twenty-something son, translated. Aziz does not know how to cook, and his mother and sister don't speak any English, so we did a lot of guessing. Actually I was surprised at how universal the physical language of cooking is, and how useful for communicating! Most of the time I could guess what Nora needed before Aziz could get the term out of his not-so-useful translating gadget. The centerpiece of the meal was an elaborate rice platter. First Nora put an enormous quantity of jasmine rice aside to soak. Then she put two Cornish game hens in a pot to make broth, with Arabic spices, lots of cardamom and cloves, garlic, and onion, and the cutest two whole dried lemons. In a separate skillet she sauteed onion with chili powder, a seven-spice blend in Arabic packaging, and a pinch of saffron she brought along in a little fold of tin foil. It was a deep burnished brick color when she finished. 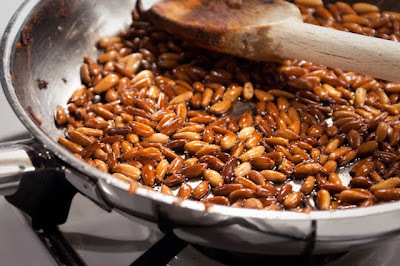 Also for the rice platter, she sauteed pine nuts in olive oil until they were rich and dark, and at the same time had a pot of broken-up spaghetti on the boil. When it was cooked, she drained it and tossed it with some of the saffron onions. 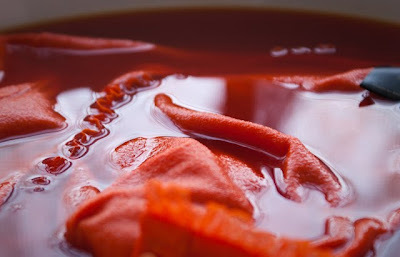 Then she took the hens out of the broth, put the rice in the broth in an enormous pot to cook, doused the chickens with the saffron onions, and put them in a hot oven to brown. Whew! At this point we had a lot of dirty dishes! Meanwhile, she started on the salad. 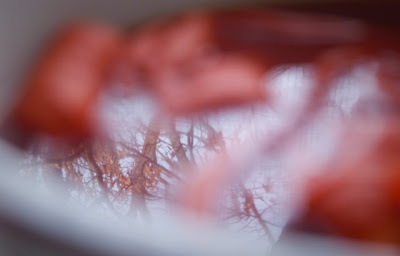 Everything she used she chopped into the tiniest, most delicate shreds, using my shamefully dull paring knife. A head of iceberg lettuce, a bunch of green onions, red, yellow, and green bell peppers, canned corn, black olives, and two whole bunches of cilantro, and several cucumbers. 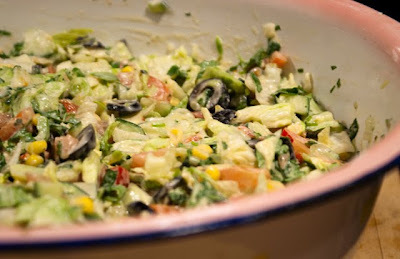 It all went into a big bowl, ready to be doused with the most surprising salad dressing. When I described it to Giles, he said, "Wow, that doesn't sound good for you!" Nora mixed mayonnaise, ranch dressing, and--get this!--salsa con queso from the chip and dip aisle at the store! So unlikely sounding, but really good! And on the top, a big tomato cut into a flower shape. Now, back to the rice and chicken assembly. When all the components were ready, we hunted out the biggest platter I own, that only comes out for the Thanksgiving turkey. 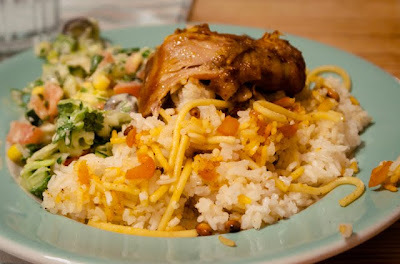 It was just right for the enormous quantity of rice that was spread out evenly on it. Then came a layer of saffron onions. Then the two game hens were nestled down in vertically, and in their cute little empty cavities Nora stuffed the cooked pasta! It flopped out so festively! Then the pine nuts were sprinkled over all, and the platter was garnished with slices of tomato and green bell pepper. All of this was carried in state to the table, which had been set by the girls. We admired the food, and Nora told us in Arabic that "the eyes eat before the stomach." I love that! She and Sarah and Aziz very graciously served up all the plates, and I was so impressed that Aziz could carve two Cornish game hens for fourteen people. It was just right. 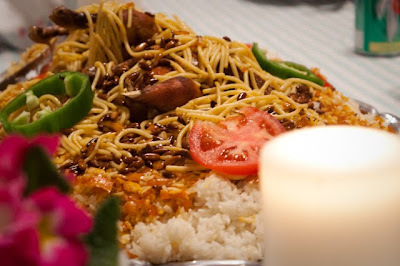 They encouraged us to mix the salad and the rice dish together, and Aziz tried to get us to eat with our hands, like him, but I noticed that both Sarah and Nora were using their forks! After we ate Aziz served the men, and Sarah served the girls, tiny cups of "Arabic coffee". This was our second hot drink of the night and Aziz was driving me crazy with his inability to tell us what we were having. The translator said *java* which was really not helpful. I'm sure our after-dinner cup was ginger with lots of sugar and some cinnamon. The first one was creamier and almost orange with lots of floral and spicy notes . . . I'll probably never know, but it sure wasn't java! Such an enjoyable evening! Nora has a twinkling, friendly, quiet presence and showed off her fancy party clothes under her covering coat when all the men were outside. A culture so different from ours, but cooking and eating together, and good times in in the kitchen and around the table, are truly universal. It's not a hostess gift when you give it to a guest who's coming to your house to cook, I don't think. 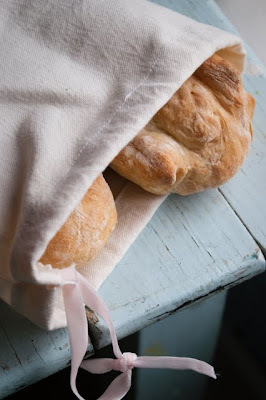 But anyway, I made it for her--two loaves of French bread in a purpose-made cotton canvas bag with a pale pink velvet drawstring. 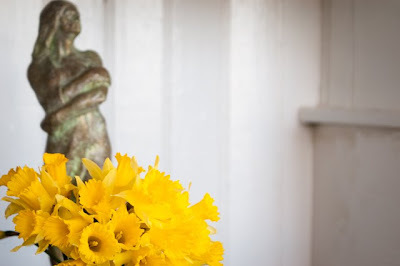 At last the daffodils are blooming enough for us to go picking. They're about two weeks later than usual! And much appreciated. Glad for a little sunshine today to warm up our cold world. 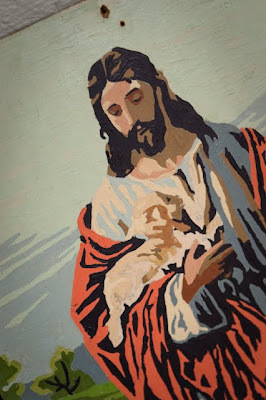 "I am the door; if anyone enters through Me, he shall be saved, and shall go in and out, and find pasture." This find is going by the front door . . . . 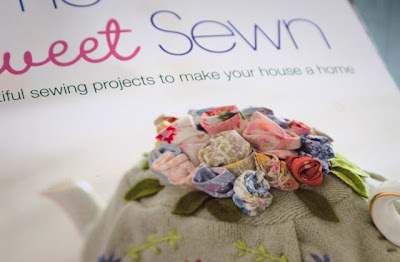 I love these little calico rosebuds on the front of Home Sweet Sewn (sadly however these buds and their felted tea cosy are the only project in the book I find interesting). 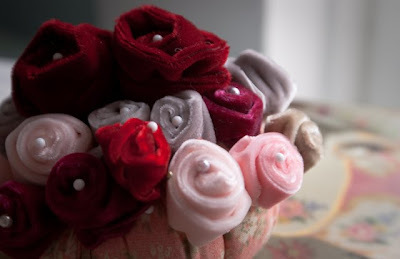 They created a mad desire in my heart to sit in a chair all weekend rolling up fabric into rosebuds of my own. I did mine in velvet, first cutting strips of the dark red, then moving on to already-cut-in-strips-also-known-as-ribbon which worked beautifully. I used about five inches, sewed the beginning end into a little point, then just rolled and gathered, and folded the second end under before stitching it in place. It was kind of hard to stop, which is why I have a pincushion thoroughly garnished with these beauties. I'm trying to think of what I don't want them on though. I want them on my shoes, my dress, my bag, my hair, my daughters . . . .
"I Know About That Stuff"
" 'I know about that old diabetes stuff, my granpaw had it wors'n you,' Puny told him with satisfaction. 'And not only can I cook for diabetes, I can cook for high blood pressure, heart trouble, nervous stomach, and constipation.' "
Shirtwaists have different style collars, but let me walk you through the collar of McCall's 3769, a classic lapel. Many seamstresses, including me, have found this difficult to understand. But I am here to say that it is possible to get this construct through your head! So let's proceed. 1. Have the bodice, collar, and front facings prepared. Actually, with this pattern you'll have the bodice sewn to the skirt as well, because there is a front button-band that runs the length of the dress. 2. 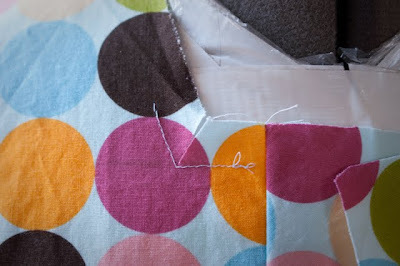 Where the dot falls in the corner of the bodice, reinforce and then clip. This is all in the instructions, by the way. It hasn't gotten tricky yet. When you do your reinforcing stitching, you'll notice that it is at the exact 5/8 inch seam allowance line. 3. Do the same thing with the facing. 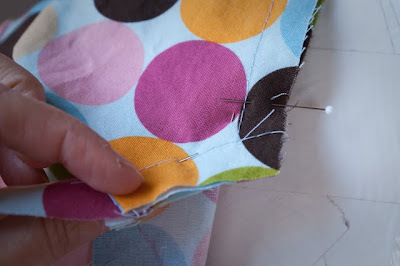 Stitch through the corner dot to reinforce, then carefully clip. Of course you realize that the facing is an exact replica of the bodice front (some of us sew for years before we catch on to these things). I'm just showing you here how the bodice and facing look alike. Don't do anything to them yet. 4. Pick up the collar. 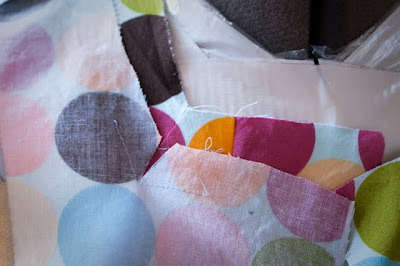 Make sure you have basted these raw edges together to keep them even: the short sides, and the long side that will join the back, but only on the outsides of the dots. The center part of the collar should not be basted. Remove the facing from your field of vision. 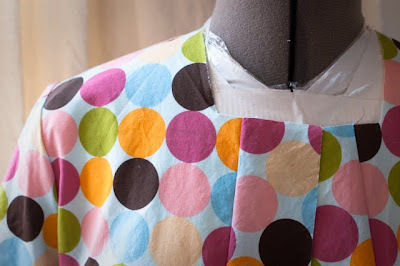 Place the collar over the bodice front so that the dot in the corner of the collar matches up with the dot on the bodice you just reinforced and then clipped. You see I am holding the collar here and laying it over the bodice. 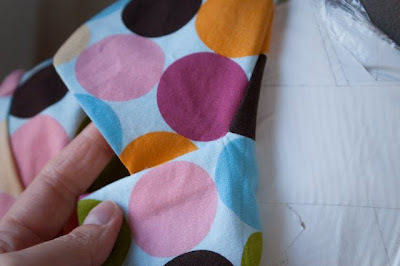 5.Keeping the dots lined up on top of each other, swivel the bodice around the corner so that it follows the raw edge of the collar. I've turned up the fabric to show the underside here. I pulled the corner of the bodice down clockwise to get it to conform the to the collar's edge--the slash allows me to do it. A diamond-shape of collar is going to be visible in the pulled-apart edges of the cut. Good! 6. 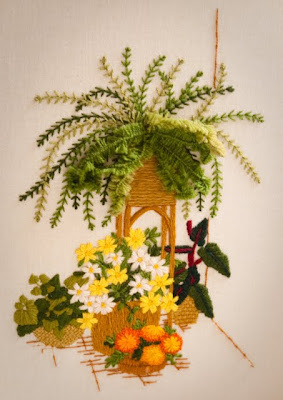 Take a deep breath, thread a needle, and take a minute to hand-baste this arrangement in place with a few stitches. Now no worries that your arrangement will fall apart. 7. Remember how the facing is an exact copy of the bodice? That's right, time to do the exact same thing to the facing. Treating the bodice and collar as a unit now, lay the facing on top as the last layer of a sandwich, lining up exactly to the bodice. Dot lies over the dots of the collar and bodice. Just as you did the bodice, you're going to give the facing a turn around the corner so that it can match up with the raw edge of the collar. 8. And baste that layer in place. Do not fear the hand-basting. A quick few stitches, unlimited peace of mind! 9. All three layers are accounted for--turn it right side out and see if you're on the right track. If you're satisfied, machine-baste it. I just like to check once more before I do the real sewing. 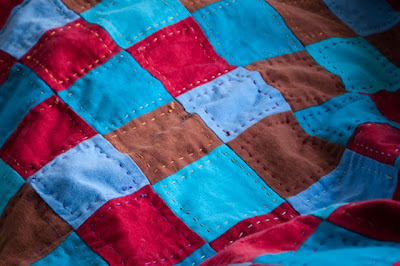 After you've stitched it in big stitches on the machine, make sure you haven't made any weird bubbles or puckers that won't press out. 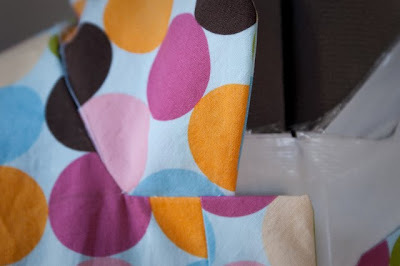 Also make sure that you have stitched inside the seam allowance far enough to have fully enclosed your clipping. When you're satisfied, then do the real thing. 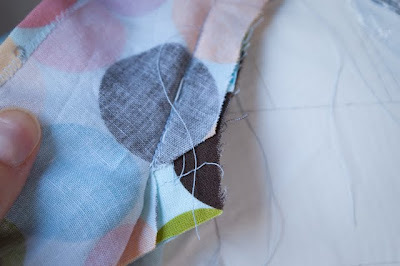 When you are machine-stitching, be very careful going past the dot. 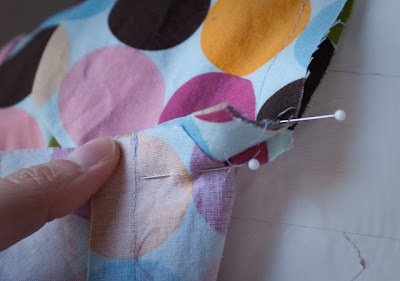 Leave the needle down in the fabric as you pass by the dot just barely to the left of it. 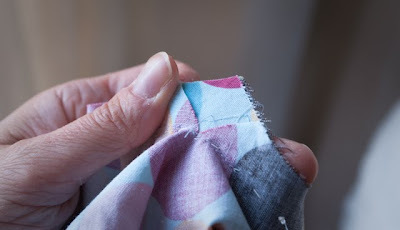 Raise the presser foot and gather the fabric out of the way and around the corner before starting around the next side. 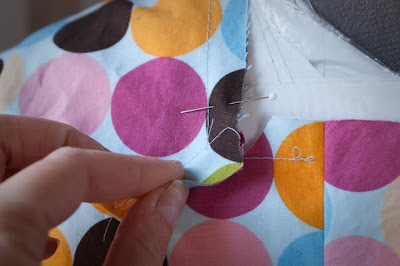 That way you won't stitch any pleats into the seam. There's that diamond-shape of collar again. That's what you want. And here's what it will look like on the inside. Remember that it's this side that counts, since the dress lies with the lapel folded out--the facing is what will be on view, so if you have to fudge, put the wrinkle on the "outside" where it won't be seen. 11. Finish the collar as the instructions direct--assuming that, unlike me, you still have that page of instructions. 12. Something to check on--when you go to do the other side, it's very important to make sure that on both sides of the dress, the collar merges into the bodice in the same place. There's a mark for this, but if you're not paying attention you may construct a collar that sits back farther on one side than the other. Watch out! 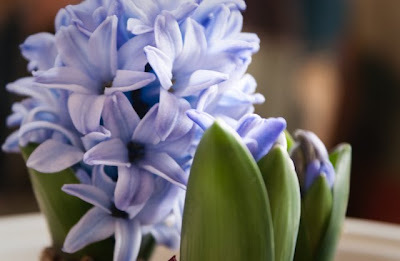 The hyacinths I started forcing indoors back in November (early November, to bloom for the holidays--ha!) are just now making their appearance. If they had waited one more week they would be tied with the outdoor hyacinths! I wonder what happened. Still, they smell heavenly. And if you count St. Patrick's Day as the holidays . . . . Thank you, Winter Olympics, for providing the perfect opportunity to embroider this quilt for a half-hour every evening. That's all I needed to get this thing finally finished. Yeah, it doesn't fit in my purse or in the car so I wasn't getting those little sessions in while waiting for a music lesson to finish. 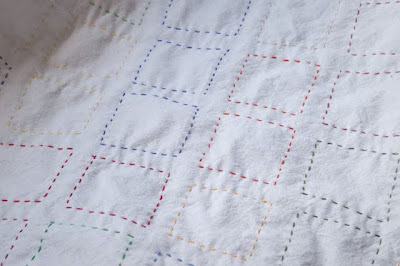 The front side is painfully bright linen (all upcycled from the thrift store) in diagonal stripes, machine-pieced. No batting, and a canvas back. 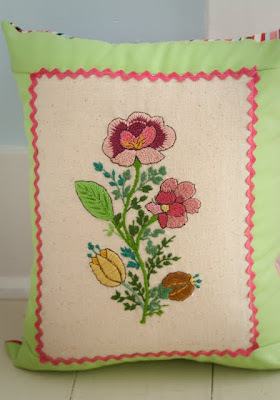 Then I "quilted" it by embroidering a bright running stitch around each square. It fits a twin bed and weighs a ton. Have you succeeded or failed when the back looks better than the front? No matter, I like it! 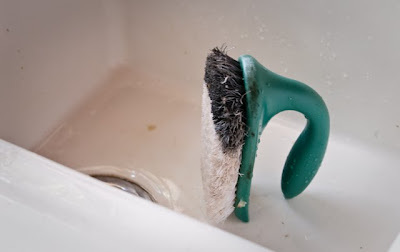 The mental list of things in my house that needed to be actually *scrubbed* had gotten serious. I left my workout clothes on this morning because I was going to get dirty. First Frederick's cage came apart in about seventeen gigantic metal panels. A chore that's best tackled outside in the sunshine with a big bottle of soap and a garden hose, but I wasn't waiting any longer for that kind of weather. I know, disgusting to do it in the house but everything was thoroughly vinegarised afterwards. Whew. Much better. The floor behind the woodstove where the mysterious black liquid by-product of a wood fire drips onto the floor when I'm not looking. Whatever. It's clean now. Then. The kitchen floor, by hand, with a brush. 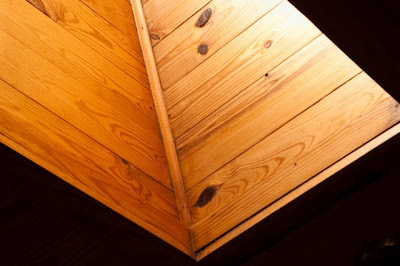 These floors are very soft pine, with most of the finish gone. The thing about scrubbing them is there's really no end to what you can scrub off with a stiff brush--it's actual wood coming up. So you take up as much as you think the floor can spare, balanced by how far down the stains go. The floor's a little thinner now, but that description you always read about tables in the flagstoned kitchens of rural England, and how they're scrubbed white? That's what I did, but only where things were really bad. And now they're really good. 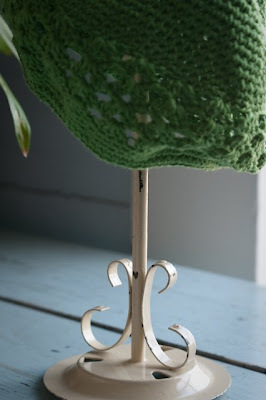 I was thinking how nice it would be if I could find cheap, cute hatstands for Daisy's collection of knitted, crocheted, and wool hats and caps. Like, what if they were in every thrift store for a quarter a piece--wouldn't that be nice? Especially if they were already a flaky creamy color? In just the right size for her dresser? 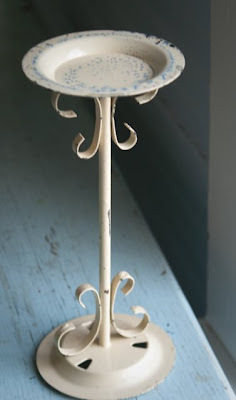 They were right there in front of me all the time: candle stands. 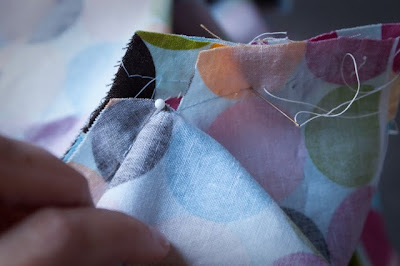 Use as is, or use this simple tutorial for a stuffed pincushion (sew it on upside down with strong thread) for a nice stuffed top. When Clara uncovered Albert's cage this morning he was not well. 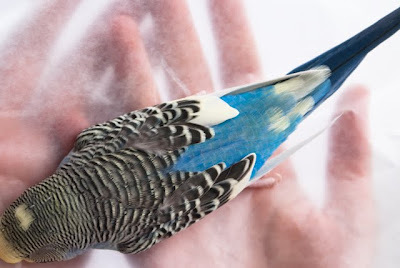 Then, as birds do, he failed quickly and died in the middle of the morning, in the shoebox set up for his comfort, with a spray of millet and his beloved mirror. 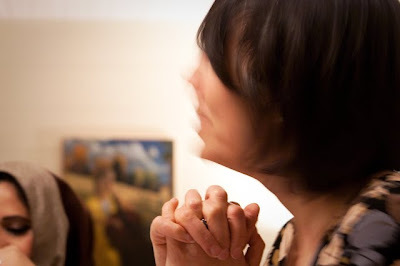 Clara kept vigil beside him until he was gone, then turned immediately to her music. Just last night at dinner the Composer had remarked on how much Albert had to say. That was always true. And always such beautiful feathers. It was one of those moments when I actually couldn't believe what I was seeing in the thrift store bin. 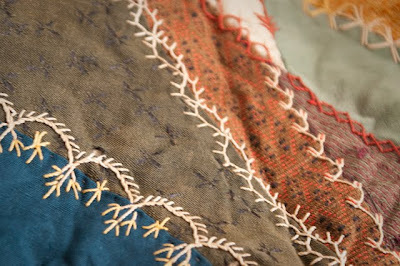 A beautiful, large, ancient crazy quilt for Two. Dollars. 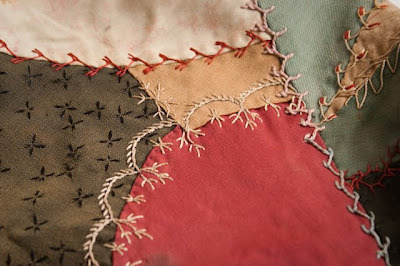 This has the most elaborate embroidery I have ever seen on a crazy quilt. And all the fabrics are genuine--very fine wools and heavy textured cottons. A moth-hole here and there, nothing I'm going to fix. The back looks like thirties cotton print. It does have a few rips I may mend. 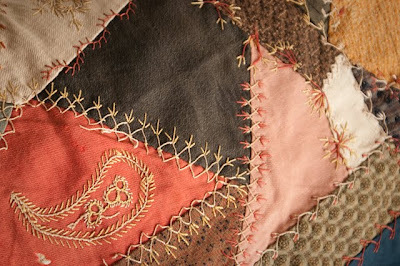 But since I intend to let the quilt sit out on the couch looking drop-dead gorgeous, I may not bother. 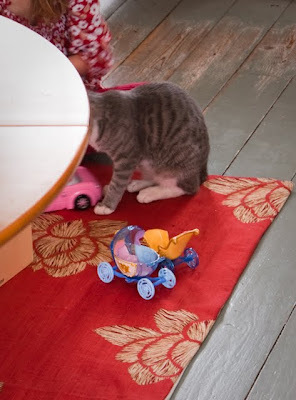 Because the woven cotton rug was starting to really spit out strips of fabric. And the colors weren't pink and green, they were murk. 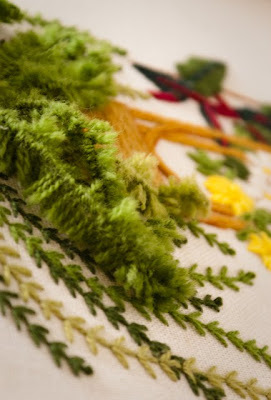 Then thinking about rugs, and how much they cost, led me to decide: I could make one myself. Surely the pioneer women did it. 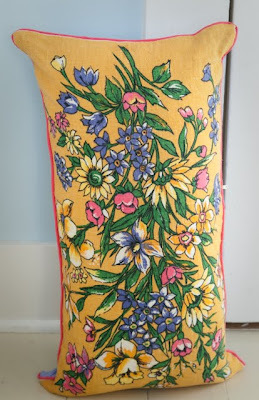 I had a beautiful piece of upholstery-weight fabric in my stash, a pass-along from a friend whose father creates drapes for the wealthy in Montreal. All I had to do was face it with canvas. 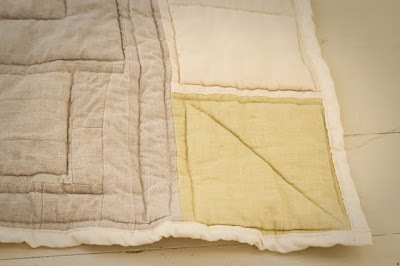 I sewed three sides together while it was inside out, turned it right side out and then slip-stitched one side closed. It really does seem like a rug now. Huh. Now I'm thinking that I have made the living room over in red and yellow for the rest of the winter. 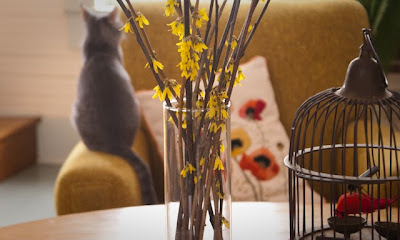 My $10 gold armchair, my thrifted poppies, my forsythia forcings, and my new rug. Ignore the gray. Lucy spends most of her time in my newly-styled area looking appealing. Because she thinks that bird is real. 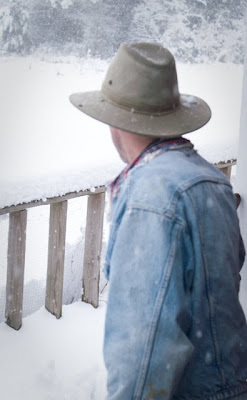 This has got to be the most exciting winter of all time, at least since the seventies. So much snow we actually need to shovel it (well, the Composer was out there with the digging spade because that's what we have). We feel like people in a book! A book set up North! They're whole wheat. And walnuts are good for you. Just overlook the massive quantities of butter and brown sugar . 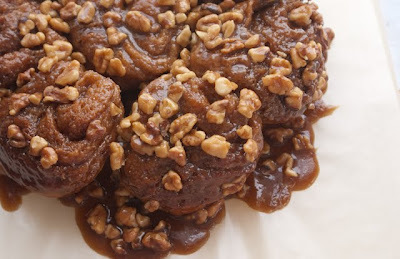 . .
Use any light sweet dough recipe, and melt together in a saucepan 2 sticks of butter, 3 cups of brown sugar, and 1/2 c. corn syrup. 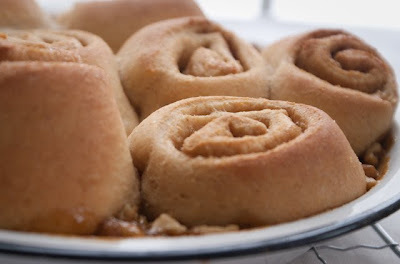 Pour most in the bottom of your pans (with 1 cup of walnuts per pan), reserving some to spread in rolls as the filling. Makes enough to handle a two-loaf (about 7 cups of flour) quantity of dough. A few new things in the shop tonight. And then I always want to quote the fabulous line from B. Potter's Ginger and Pickles: Come try! Come buy! I never thought I would say this: I love going to the gym. I always thought I would hate strength-training. Cause it hurts, you know? But I kept reading articles in the Composer's running magazines touting core strength as the way to avoid running injuries. And then I realized that there was a little no-frills gym •right beside• the girls' gymnastics place. So, I thought, I'll go once a week for an hour I was already spending right there. Then I realized I love it, though I don't know why. And I started running over during Clara's cello lesson (I can just barely squeeze my routine in if I work around the snooty group of ladies from the bank who come in at the same time and use ALL the equipment at once, in their work clothes). I can't really justify a third trip every week, but I'd like it if I could. I never know what I am going to start loving in my life. Surprises! 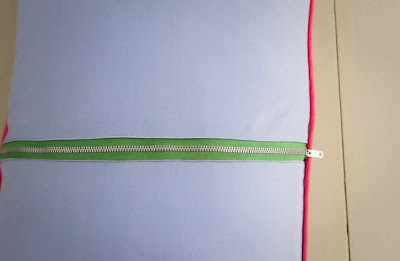 a bright zipper as part of the design. How else am I going to get rid of a giant kelly green-and-metal monstrosity? This little chica started with an offbeat embroidery I snagged. 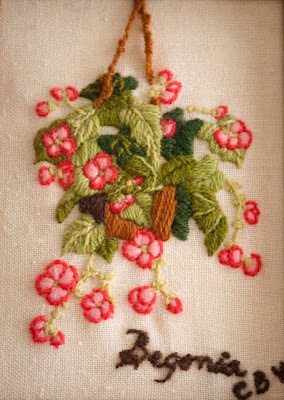 It's nicely stitched, but the buds? I'm going to go ahead and call them ungainly. No matter! 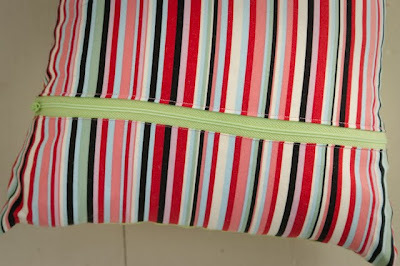 Some hot rickrack, a little lime green, and a lot of stripes on the back and it's a statement. These will go in the shop later this week--I'll announce. I brought a shirt home from the thrift store without realizing the shoulders were faded. It had been a mango color; now it's going to be more tiger lily. In case you're needing more chocolate. Use any recipe for light, rich, white bread (preferably with lots of butter and eggs). 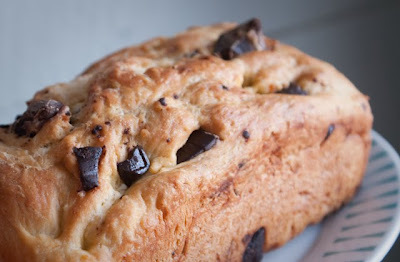 Let it rise as usual, but before shaping it into loaves, chop a lot of semi-sweet chocolate (I used 6 ounces for two loaves) into rough chunks and fold into the dough before the second rise in the pans. Bake normally. It's like an easy chocolate croissant knock-off. It's so good. Why have we abandoned the rolled-up cake? I gather that they used to be common fare and now you never see them. 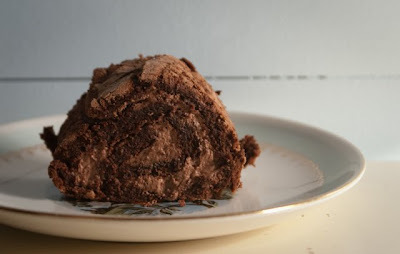 This one is made from a chocolate souffle-like layer, baked in a jelly-roll pan. Without even cooling, it's sprinkled with cocoa, then spread with chocolate cream (whip a cup of cream with 3 T. cocoa, 1 t. vanilla, and 1/3 c. powdered sugar). Tightly rolled, wrapped in foil, then refrigerated: oh my.